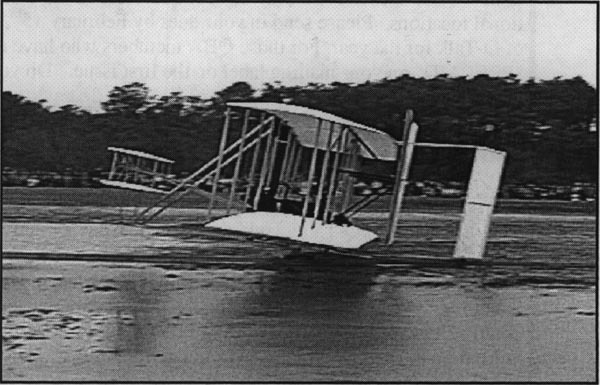 Ed Note: When I learned QBA Founder, Jim Masal, would attend the 100th anniversary at Kitty Hawk, I asked him to share his observations of the event and the prototype canard aircraft being featured, Th ank you, Jim ! Taxi, taxi, taxi, taxi, taxi, taxi, taxi... and when you are ready to vomit from it, taxi one more hour before your first flight. That was an editorial admonition I wrote many years ago in QTALK. I also wrote that I was sick and tired of the many stories that I heard about homebuilt aircraft that "accidentally" flew their first time. No piloted airplane "accidentally" flies in my opinion; it flies because the bonehead behind the stick permits or encourages the accident. While some of these accidental flights are brought to ground successfully, there are higher odds than normal that you will be once again working on your plane for months, or you will be recovering from injury for months or you could meet with an untimely death. I am reminded of all this because of recent widely publicized events in which highly paid, highly skilled, hired craftsmen have succumbed to the emotion charged siren call of premature first flight. One recent afternoon as I adjusted into my couch, I flicked on the last half of a National Geographic special on PBS about the reproduction of a Wright B Flyer. A great deal of detail was presented over how Ken Hyde and his helpers were making this plane as exact a replica as possible. The airframe guys went to the Smithsonian to accurately measure and photograph the surviving original. The engine specialists fiddled and fiissed with an accurate power plant. Months passed and the airframe was rigged to satisfaction and the engine was running well. They were ready to go. Then Mutha nature decreed 3 days of rain. On the sunshiny fourth day, the Flyer was dragged out of the hangar. The team found that the first couple hundred feet or so of grass runway was still soggy so they set the plane down on a better area up the runway (the Wright B has wheels). Pilot Hyde explained he was about to do a taxi test. Not many minutes later the Wright B was wrecked and hanging in the trees not far from the end of the runway... and my wife became startled at my language. How in the hell do you start your first taxi test and end up in the trees????? Ken explained. He gave it power to start down the runway and then shortly, the plane started to veer toward a drainage ditch. Ken applied full power to avoid an accident (ha, ha, ha.) and the plane leaped into the air. For the briefest of times, all went well until pilot inexperience at the controls and the forest growthrate exceeded the ascent of the aircraft. Unlike you and I, Ken Hyde is getting paid big money to build this replica. You might think he has. therefore, more sense and/or caution than you or I. Not so far. Good sense tells me that a run into a ditch is more survivable than some other unknown height over terra firma. And since I had one from about ten feet, I know about what I say. But beyond that, if you intend to TAXI test, NEVER give the plane flight power. NEVER sit on the end of the runway telling yourself: "I'll just give it full power to start it rolling and then I'll reduce the power before it flies." That is a recipe for disaster (especially if you've not buckled up or put the cowling on... there have been fatalities on both of those scores). BE PATIENT, let the plane accelerate slowly at low power and feel the TAXI test. Creep up the power on successive runs until you feel the plane getting light: at that point you are done taxi testing (unless you are still demolishing runway lights). Other traps and snares. If you announce your intended first flight to the world or have the National Geo. camera crew standing by, you will face a force of ego compelling you to perform. If your gut tells you "no go" or if you find some small glitch at H-hour, there will be a strong desire to dismiss these matters and just, what the hell, go for it. Odds are better than average on the outcomes in paragraph 1. On December 17th at 10:35 in the morning, I happened to be passing through the metal detectors leading to Kill Devil Hills. 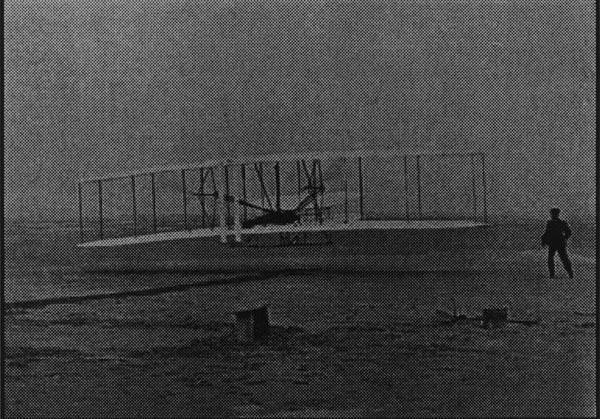 At that exact moment 100 years earlier, the Wright Bros, made their first powered flight. On this day, the weather was gloomy, overcast and beset by passing showers of varying strengths and durations. The balloon did not go up at 10:35am so to speak. It would have on the beautiful previous day or the day after, but not this day. I was glad to be there, rain and all. In my imagination, I always thought the Wrights flew from a large sand dune near the beach. Not so. They flew from or near the largest of 3 Kill Devil Hills (sand nonetheless) about a half mile inland from the beach. This hill has to be a couple hundred feet or so high. This day the area was like an aviator's Woodstock complete with mud. There was a large stage from which President Bush, Tom Poberezny, Chuck Yeager and other luminaries spoke; there was the Wright hangar/tent, food vendors, trinket tents, a dozen exhibit tents, two Jumbotron screens you could see from the Hill and maybe 30 airplanes scattered for viewing. Throughout the day, various aircraft made a pass or 2 over the area but these were no big whoop for an Oshkosh goer. Wouldn't you know it, about noon, just when I was in a looooong hot dog line with my stomach pounding against my backbone, there was a rustle of activity way behind me at the cordoned off mud field serving as the Wright Aerodrome. The Flyer had been pulled out. And now the hot dogs played chicken with the Flyer. I opted for hot dogs but the line kept getting smaller as curiosity got the better of my fellow eaters. I bet the ground crew would be fussing around long enough to see me on the hill eating when they launched. And so it was. I saw the flyer come right on down the launch rail, (the crowd hushed with anticipation), right off the end of the rail and into a mud puddle. All under the direction of the so-called Flight Manager, the famous test pilot Scott Crossfteld. The speakers announced that the wind had dropped off belowthe minimum 10 knots and, well, the engine wasn't giving its full rpm. Now some of you know what I'm thinking. We have a cast of some 50,000 spectators, TV satellites galore, thousands of individual snap cameras and videos, dignitaries up the ying-yang and Jumbotron screens. We have hostile winds, a fussy engine, a bonafide, Aey numbah one test pilot, but we're gonna fly this sumbitch anyway. Do you see what I was talking about earlier?? It was a fizzle of hype. At 2:00 p.m. they pulled the Flyer out again and started the engine but the winds had died out. It was said the plane was headed for the Smithsonian. We all slogged through the slushy mud and took our sony wet asses to the shuttle busses and home. I never appreciated how smart the Wright's were till the hype of this year though. They built a tough, light biplane, they developed new tables of lift (Lillienthal's widely used tables were 60% in error), they developed the wind tunnel to test airfoil shapes, they determined the optimum airfoil, they developed wing warping for turn control and a hinged rudder, they developed the first efficient aviation propellers, AND (for purposes of this missive) they showed us how to conduct a proper test flight program. Starting with five-foot kites, the Wrights continually refined their design over 4 years. In 1902 they made over 1,000 individual glider flights (read this as taxi testing/ pilot training) and they never let their emotions run ahead of their intellects. They specifically chose Kitty Hawk/Kill Devil Hills because of the winds and the isolation from publicity. Let that be a lesson for you. Jim Doyle, of Springfield IL. taxiing his C85 powered Tri-Q at Sullivan, MO. Jim's plane has many unique features like an auxiliary fuel tank suspended below the main wing, electric reflexor and reed switch to detect low fuel levels in the aux tank. See Q-Talk issue 93 for more details. You can order a printed copy of Q-talk #102 by using the Q-talk Back Issue Order Page.